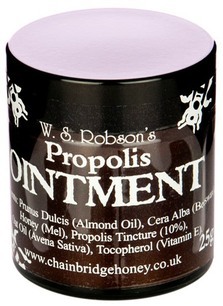 Propolis Ointment is made using propolis collected from the beehive, plus honey and beeswax. The Antiseptic and healing qualities of propolis may help wounds and burns to heal. Place a little ointment on the affected area. It can also be helpful in treating excema and psoriasis. Use Sparingly. Ingredients: Prunus dulcis (Sweet Almond Oil), Cera alba (Beeswax), Mel (Honey), Avena sativa (Oat Oil), Carthamus tinctorius (Safflower oil), 10% Propolis Tincture, Tocopherol (Vitamin E). This formula is free from parabens, SLS and synthetic colours and fragrances. Only the highest quality vegetable oils and essential oils and not test on animals. This products contain honey and beeswax, from colonies of indigenous bees, supporting the continuance of British beekeeping. Skin-friendly product made in Britain by a bee-friendly family.